Easily add the files to the conversion list by searching them in any folder (including the subfolders) present on your PC. 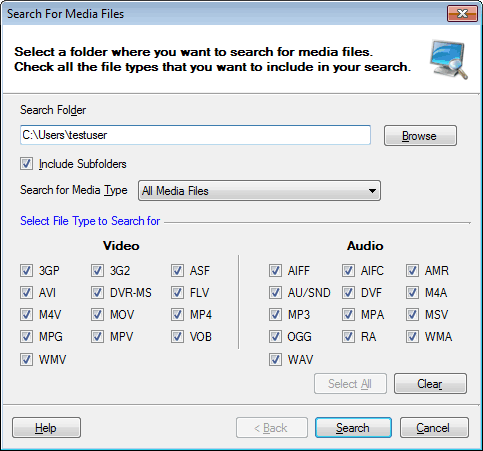 Click File >> Search Media Files. Specify the folder to search with the Browse button. You may choose to search the sub-folders present within the specified folder by enabling the option Include Subfolders. If you want to search for a specific type of media file, you can narrow your search. Filter your search by specifying whether it is an audio file or a video file from the dropdown. All the supported media types are displayed so that you can simplify your search. Enable the media types that you want to search for so that the files of specified format are displayed instantly.